Bus from Singapore to Penang is one of the most economical transportation option to travel to Penang for famous Penang food and Unesco World Heritage Site Georgetown. Though budget airlines have been in the market for years, the service of bus to Penang survives even though passengers need to travel about 10 hours by bus. One of the reasons is that an airline ticket is much more expensive than a bus ticket (unless you get it during a limited promotion period). Another reason is that travellers can always take a night bus to Penang. By the time you wake up in the morning, you are already in the beautiful Penang Island. 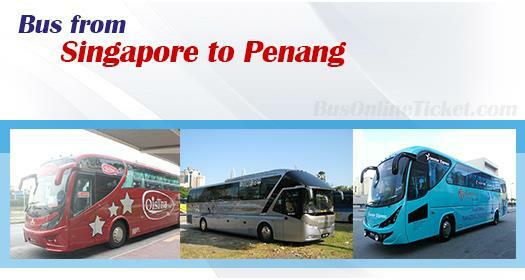 Grassland, Starmart, Seasons, Billion Stars and WTS are the few coach companies providing bus from Singapore to Penang. Grassland is the famous brand among the locals with its consistent quality service in the past 30 years. Seasons Express and Billion Stars are the new players with a strong base in Penang. The journey’s duration is about 10 hours as mentioned above. The bus fare is in the range of SGD 40.00 – SGD 64.00, which is much cheaper than airline ticket that usually costs around SGD 150.00 – SGD 200.00 during weekends. It is always better to book you ticket in advance to avoid disappointment, due to the limited trips daily from Singapore to Penang. Billion Stars, Seasons, Starmart and Grassland coaches depart from Golden Mile Complex in Singapore. Billion Stars also depart from Kitchener Complex (Lavender MRT) while Starmart also depart from Boon Lay and City Plaza. On the other hand, WTS coaches depart from Jurong East and Our Tampines Hub. As for arrival points, usually, the coaches will drop some passengers along the journey at places like Juru Toll and Butterworth, before terminating at Sungai Nibong Bus Terminal. Billion Stars also drops off passengers and terminate at Penang Komtar. Planning to spend your holiday in Penang for the food and Unesco World Heritage Site Georgetown? Please book your ticket in advance online to avoid disappointment. All online bookings made in BusOnlineTicket.com is instantly confirmed. This will secure your transportation to Penang to enjoy your holiday.